Black and white photograph of two Hans Coper pots, exhibit numbers 35 and 37 in the travelling exhibition Ten British Potters, first shown at the British Crafts Centre from 4 to 13 July 1972. 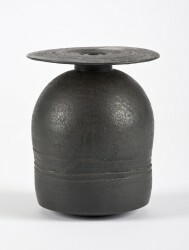 Photograph, Pots by Hans Coper, photographer Geremy Butler, c.1972. Crafts Council Collection: AM279.